A Diode Mrix is simply a set of Diodes placed in an order between a switch and a set of Points. You will remember that a diode only allows current to pass in one direction. So we can use this ability to set a number of points to change to create a path for the train to travel, all from one switch. As you will have in certain cases more than one switch connected to a point motor, the diode stops the current flowing to a point set that you do not need at that point in time. As you can see from the drawing below you have sidings A to G all feeding from the Main Line. In each case there are a number of points that need to be set for each siding. For the purpose of this example we will call a straight through points ST, and a Turn out points TU. The first thing to do is create a Truth Table. example: To get from the Main Line to siding A the following must be true. PM10 must be Turn out TU, PM11 must be straight through ST, PM12 must be straight through ST. So for this to happen 3 sets of points need to be activated from one switch. On the table above you will notice the top line shows the Points designation number, the next line has 2 columns for each set of points ST & TU. On the left hand side is a column with the siding letter which is also the control switch letter. We want to place the Loco and Wagons in siding A. So the first set of points to be changed to TU is PM10 as shown in the table above. The next set of points to change will PM11 to straight through as shown in the table. The final set of points to change is PM12 to straight through as shown above. PM12 Straight through does not have any other 'Y' in the column so you do not need to use a diode, a link wire is placed here. However using a diode will not affect the circuit in any way, so if youprefer use a diode. Repeat this for each siding until you have a Truth Table similar to above for your fiddle yard. Now we need to transfer this information onto a Strip board Blank and add the diodes in the correct places. First mark the top of the stripboard blank with the switch positions and the Point Motor ST & TU. This will help you get the diodes and links in the right place. 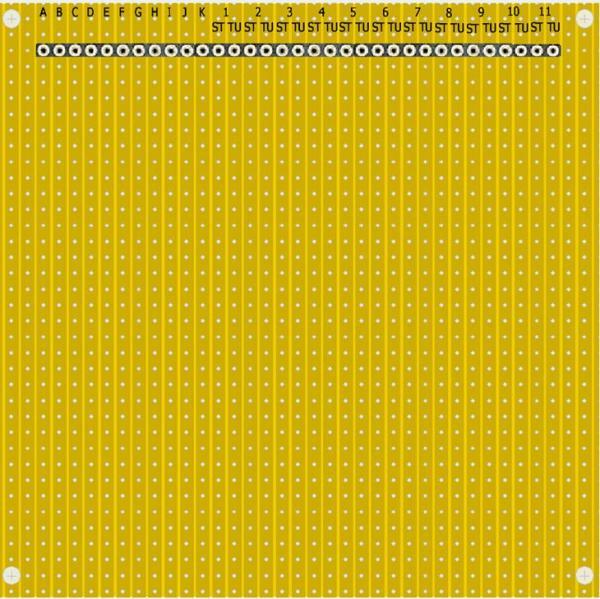 Below is the strip board with the diodes and links in place for the example layout above. As you can see Line A on the far left has three connections. Third: A Link from A to PM11 ST (If you follow this line down to the bottom you will see no other connections - this is why a link is OK.
Now continue down the strip board fitting the diodes in the correct places as per the Truth table. You will notice there is one switch called ML. After you have completed your work in the siding you will have to set the MAIN LINE (ML)back to straight through. The example has 3 sets of points on the main line, so all 3 sets must be now straight through, hence the ML switch. 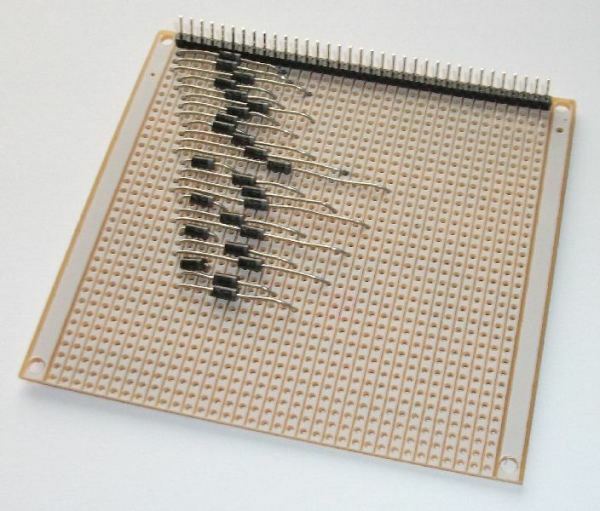 The next stage is to connect the switches and the points to the diode matrix board as shown below. Position the board so the runs of cable are as short as possible. The switch can be any Normally Open (NO) contact switch - this could be a push button as shown, a stud connection, or a momentary toggle switch OFF-(ON). One side of the switch is connected to the positive supply voltage and the other side to the corresponding siding pin. The points are connected as shown. One coil to the ST and the other coil to the TU pins. The negative (Ov) side of the points is connected to the Ov of your power supply. CDU as you are energising a number of points simultaneously your power supply is not likely to be able to cope with the power required, it is therefore advisable to connect a CDU as shown. The diodes supplied in the kit are 1N4002 which are rated at 1 Amp at 100volts.